My daughter, Sarah, is quite an accomplished artist. Having had some training in art, I have an eye for quality and can be quite critical when it comes to such things. She's also highly competitive and wants nothing more than to "beat her old man." What she doesn't realize, is that she already has. While I was a decent graphic designer, I never have had the skill for illustration that she does. At the request of my wife, Sarah has been drawing characters from Riyria as her Christmas gift to her mother. She hates it when I show off her work, because she is stubborn (wonder where she gets that ) and any praise she receives she wants to earn on her own. No help from anyone, and least of all from me, her arch-nemesis. But my daughter doesn't come to my blog, so I can do what arch-nemisis do best...do everything possible to thwart the hero. To that end I present to you a drawing Sarah has done for my new series, The Riyria Chronicles, and more specifically the first book in the series The Crown Tower. For those that don't know. This book is the origin story of Royce an Hadrian. Two very different men, who probably not surprisingly, didn't like each other very much when they first met. TWO MEN WHO HATE EACH OTHER. ONE IMPOSSIBLE MISSION. A LEGEND IN THE MAKING. 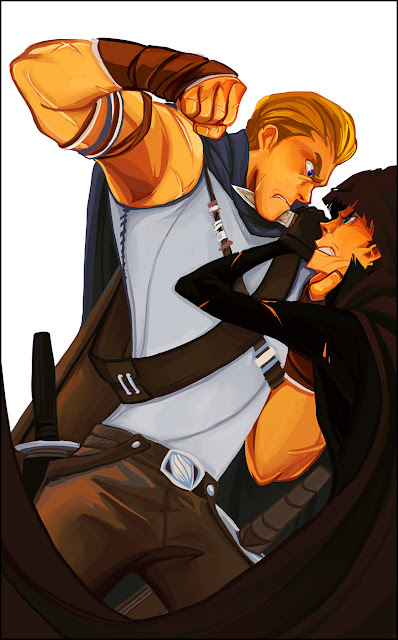 A warrior with nothing to fight for is paired with a thieving assassin with nothing to lose. Together they must steal a treasure that no one can reach. The Crown Tower is the impregnable remains of the grandest fortress ever built and home to the realm’s most valuable possessions. But it isn’t gold or jewels the old wizard is after, and this prize can only be obtained by the combined talents of two remarkable men. Now if Arcadias can just keep Hadrian and Royce from killing each other, they just might succeed. As I mentioned yesterday, today my book will be featured by Amazon and discounted to $1.99. This is a very exciting promotion of my books and I hope as many people as possible get the books at the discounted price. But you have to buy today because at 3:00 AM (EST) Theft turns into a pumpkin...okay maybe not a pumpkin but it will return to it's normal $7.99 price. I know a lot of people don’t like Amazon, I’m not one of them. I love one-click ordering, I buy everything from socks, to jeans, to books from the site—heck I even bought a rear tail light assembly for my 1994 Toyota (yes I own an 18-year-old car…and until recently its 20-year-old twin) at 1/3 of the price my local auto parts store was selling it for. When I buy from Amazon, I don’t have to go out into the cold, fight traffic or circle parking lots for hours to find a space. I don’t even have to wait until the store is open. It's always is there any time, day or night. Amazon’s customer service is also incredible. On two occasions my wife broke her kindle (her fault not theirs) and in just a matter of two-days a new one was in her hands, along with a prepaid box to send the broken one back. No hassles and friendly people on the phone. What could have been an incredible hassle turned out to be a pleasurable experience. But it’s not just as a consumer that I appreciate Amazon. Without question they made my career possible and I can think of no other organization who have done more for authors in regards to providing them the means to earn a living from their writing. If Amazon had never existed, my books would have remained in a drawer, or shared with just a few close friends and family. But let’s talk a moment about “discoverability.” This is that huge hurdle that is the bane of every author. “Back in the day” it was bookstores, and people spending hours leisurely browsing through tens of thousands of books, that got new authors found. But times have changed. Borders is gone, and much of the retail space at Barnes and Noble is now taken up with toys, nook displays, and in-store cafes. The total number of titles carried is down significantly. Shelf space has shrunk, and in the not too distant future I anticipate that it will only be the household names that will grace the shelves. Say what you will about Amazon, they know how to do things right. Through their recommendations, books also bought features, and bestsellers lists I’ve found dozens of authors I’ve never heard of before…both self-published and from traditional houses. 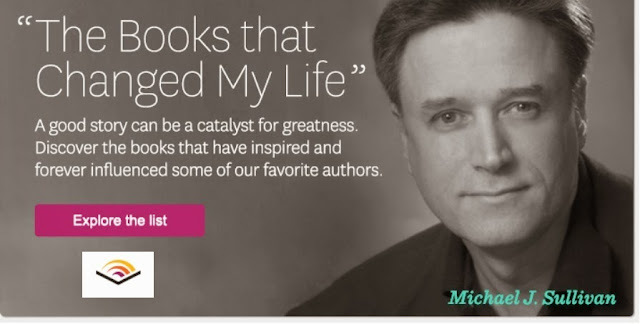 I can look at my author page, and see what other authors are cross-selling well with my books—a good sign that I might like what they have written. Recently Amazon started a new Author Rank feature where the top 100 authors in a given category were listed. For the first time I could get a feel for how I measured up with my peers. Royalty statements only come twice a year, but now at any given moment I can see how my sales are doing relative to other authors. Since the start of this new program I’ve been doing fairly well. In the Fantasy Category I’ve been in the Top 100, 20% of the time and in the top 135, 100% of the time. I’m happy with those results, especially given it’s been over a year since my first release, and about eleven months since my last. Over the last few days I saw significant improvement in my Amazon Author Rank, going from 124 on December 17th to 27 sometime yesterday. As I said, the bump was temporary and the peek has come and gone. I currently rank in the 40’s and I suspect it’ll continue to fall (hopefully not further than my initial levels), but I’m happy because at least for a little while some people who didn’t know me might have seen my name and my books alongside authors like Abercrombie & Weeks. It’s a program where Amazon takes one book (or sometimes a group of books) and deeply discount it for 24 hours. 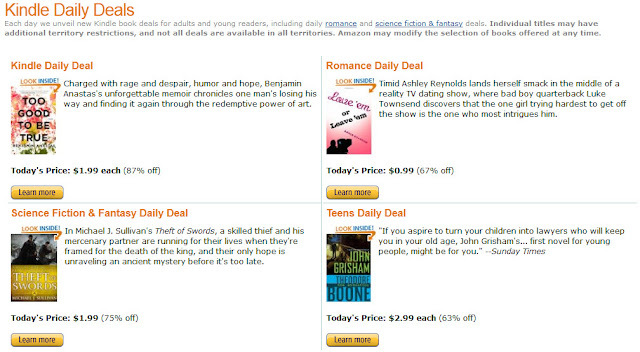 They actually currently run 4 daily deals (general interest, science fiction & fantasy, romance, and children’s books). Right now the list price for Theft is $9.99 and Amazon generally has it discounted to $7.99 but for 24-hours (starting 3:00 am EST) you can get Theft for just $1.99 that’s a savings of 75%! If you already have a print or audio version, and want to pick-up the ebook this would be the perfect time to do so. But it also provides a great opportunity for sharing Riyria with your friends and loved ones. For less than $2 it makes a great “stocking stuffer.” And, not surprisingly, Amazon makes it easy for you to gift an ebook. Here’s how it works. 1. All you need is the email address of someone you want to send the book to. 4. 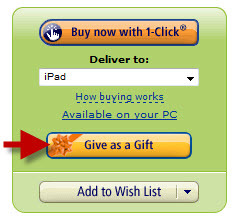 The person who receives the gift can download the book anytime they want…they don’t have to receive it on the day of the Daily Deal. 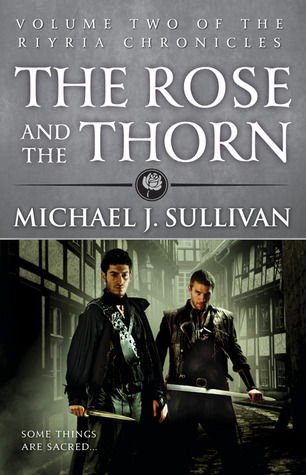 If they already have Theft of Swords, or just don’t think it’s the right book for them…they can accept a gift card instead and use the money to buy something they would rather read. NOTE: Even people without kindle ereaders can read a kindle ebook. Amazon has a kindle application and their software runs on ipad, iphones, blackberries, computers, tablets, and just about anything with a screen. So even if your friend or loved one doesn’t have a kindle…they’ll still be able to read the book. So, if you’ve enjoyed Riyria, or maybe you’ve heard of it but haven’t purchased yet, today (Sat 22nd of Dec.) is not the day. Wait a few hours (Until Sun the 23rd) and save yourself some money, and hopefully with so many sales coming in a very short time, the book, and the series will get a little more attention. Even if I don’t get in the Top 100 I’ve had a great 2012 and a holiday season already filled with joy, and much of that is attributable to all of you and the support you have given me and my books. I hope you are having a safe and happy holiday as well, and that 2013 will bring you and yours a very happy new year. I wanted to sell fifty books. That had been my big goal. In the Spring of 2007 I had finished writing Wintertide and no one showed any interest in reading it. No one. Not a soul had read a word of Emerald Storm even though that book had taken me almost two years to write (the process interrupted part way due to the move to DC,) and had been finished for six months. At the same time my first agent had stopped emailing me. Hadn’t heard a word on her search for a publisher in almost a year. My hope of getting published, which had seemed so possible a year and a half before (when I signed with the agent), was quickly fading. All of that was deflating, but what put me into a depression was that even my wife hadn’t read the books. She’d stopped after Nyphron Rising two years before. She was working hard and just didn’t have the time. I didn’t want to say anything. I saw it as supremely selfish. She was struggling to keep food on our table and a roof over our heads. Robin was stressed and I couldn’t complain that she didn’t read my stupid books. She noticed I was growing more and more miserable as spring came on and eventually coaxed out the truth. Discovering that my agent had suspended her business due to personal problems and that traditional publishing had already rejected The Crown Conspiracy, my wife suggested we try self publishing. This was crazier than it seems. Some new authors have complained how hard it is to become successful in self-publishing today as opposed to “the old days” like when I started. But in the summer of 2007 the Kindle didn’t exist. Ebooks were mostly unknown. Self published novels were known to be the product of vanity presses, the foolish and egotistical result of talentless hacks. Success stories in self-publishing were insanely rare and usually restricted to non-fiction. This was the bottom—the place authors went to die. We hired WendyJo Dymond, an editor we found on the Internet (who I was very pleased with.) I created a CGI cover of a dagger and a crown in a puddle of blood, and laid out the book for print. We even scrapped the cash together for a print run of 300 books that arrived right around Christmas time at the end of 2007 while I was busy writing Percepliquis. Robin was educating herself on how to get reviews, how to get the books into bookstores, and how to use social media to promote. There were no guides, no books, no websites on self publishing back then. We had to figure it out on our own and invent stuff. Then Robin asked me what our goal ought to be. How many books did she have to sell for me to feel I had achieved a level of success. “I can do that,” she said smugly. I wasn’t at all certain she could. Such was the state of self-publishing in 2007. Those original 300 books are still in my closet because on January 1st 2008, we found the email from AMI saying they wanted to publish me and the notion of self-pubbing was abandoned. Instead Robin used her newly acquired wealth of knowledge to hold free seminars to help others taking that path. Given my goal of selling fifty books, I was thrilled to sell out the first print run of 2200 Crowns that AMI printed. This was success in my eyes—huge success. I was pretty content. And sales continued to rise as more of the series was published even after AMI was out of the picture and we finally did self-publish. I was so pleased I walked with a swagger. I had done it, I had achieved the impossible. The thing is…I didn’t know what was possible. I don’t think most new authors do. When you write a book you hope to get published. You hope to sell several thousand copies. Ten thousand would be fantastic, because most books don’t sell that many. If you managed to achieve this, you figure that’s it, that’s all that can reasonably be expected. Sure there’s always the far-fetched dream of a movie deal, but that’s like winning the lottery. No sane person ever thinks someone will actually make a movie from their book. So if you sell several thousand copies, you’re done. Time to write the next and hope it does as well. That’s what I thought, but I was very ignorant as you’re about to discover. The first surprise came from foreign sales. I had some overseas publishers approach me before I joined with Orbit. I didn’t think much about them. I’d heard that overseas publishers didn’t pay anywhere near what a US publisher did. And this is true. I think I got about $3,000 from my first deal. What I overlooked was that there’s a lot of foreign countries in the world. For some strange reason I never imagined how big that market was. Then of course there was the Orbit deal. Something else I never thought would happen. So now that I landed Orbit and fourteen foreign overseas deals, I figured I had finally squeezed out the last bit of toothpaste from this tube. I was confident in my conclusion. I was also wrong. A few months ago I received a bonus check from Audible, who sells my audiobooks. Robin and I were pleasantly surprised to get anything. We did a little dance, because that’s just what you do at times like that. Then this week something strange began to occur. My author rating on Amazon improved dramatically. Since the inception of the Author Rank (in October) I would fluctuate between 95 – 115 for FantasyAuthors (which meant I was off the top 100 often). Then yesterday I was in the 50’s and today in the 40’s. We couldn’t figure it out. Sure, it was Christmas time. Okay so people might be buying gifts. I had a podcast recently released. I was on a few yearend lists and a few most anticipated books of 2013, but I found it odd that any of this would take me from about 100 to 41. I was beating Neil Gaiman on the Action & Adventure list! This morning my wife finally sleuthed the mystery: audio books. Like most authors, I—well okay, my wife does the looking and reports to me—watch the Amazon lists for ebooks and print, and she also checks in on the audible lists. I’m always doing fairly well on each. There was a time during the lull in the summer when only the ebooks were still showing up on the Historical Fantasy Bestsellers list. Then as fall approached my print sales improved and both print and ebooks were there. Today all three of the audio books joined them, and the audio for Theft of Swords was at #4! Now that is strange. The first one is the real shocker. My book is listed along with titles by J.R.R. Tolkien, Stephen King, Nora Roberts, Vince Flynn, and Ken Follett. As it turns out we completely underestimated the audio market. 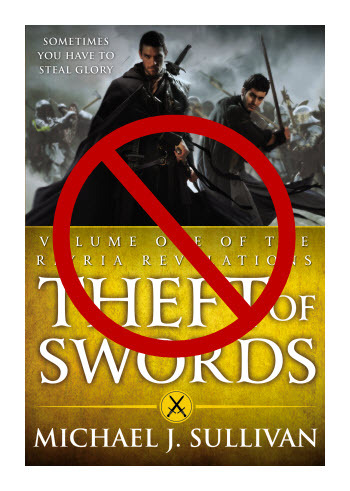 Theft of Swords now has 200 reviews on Amazon. But—on Audible.com it has over 800 with an amazing 4.5 rating! All I ever wanted was to sell fifty books. According to royalty statements, unit ledgers, and including my self-pubbed numbers, I’ve now sold over a quarter million. And that doesn’t include foreign language or…audiobooks. 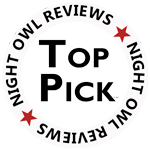 Thank you Tim Gerald Reynolds (the narrator of my audio books), thank you readers, AND listeners, and thank you audible for making audio versions so popular. You’ve made this a very Merry Christmas. I've had a lot of interviews, and there's been many articles on me and my "rise to fame." I didn't even realize how much of this was out there until I did a podcast with Dave Robison on his Roundtable Podcast (which will be published in two parts on Dec 14, and 18th) and his intro to the show was a dramatic story about my life. I was listening and thinking, how does he know all this stuff about me? After the show he explained he just found it on the web. I was live chatting with another person who was asking my advice, and I began giving examples from my own experiences and they mentioned, "yes, I know your story almost as well as you do." It's kind of eerie, really. So apparently there is a glut of me, and yet just today another article came out in The Star Online. I don't make a habit of linking everything written about me. I used to. I used to be so shocked I had to share it with the world. I think people forgive such an attitude in a new author the same way they smile and shake their heads when an excited puppy pees on the floor. Nevertheless, I really liked the Star article. I know the story better than anyone, and I was entertained reading it, so I thought I would link it here. The article is called: Second Wind. Jeff Miller is an author. I can't begin to tell you how that one sentence pleases me. I'm certain it pleases Jeff even more. Jeff and I met as members of a small writers group in Clarendon, Virginia. The group gathered at a Barnes and Noble each week—second floor near the windows, sandwiched between History and Current Events. I always liked that. Something inspiring about entering the doors and seeing Fitzgerald, Whitman, and Shelley painted on the wall near the coffee shop, peering down. Ghosts of literature past blessing us with stern looks and the heady aroma of dark roast, the stinky petrol of writers. This was as close as our cross-section of Americana would get to a bohemian coffee shop where writers paid their bills with poems. We had a librarian, a teacher, a lawyer—more than one I think, but that's to be expected just outside DC. Some of us were originally from the Midwest, the South, the east or west coasts, one even from Germany. We were young and old, male and female, newlyweded and long ago divorced. A few had kids, others hoped to, and some spoke of grandchildren. We had scholars, soldiers, mothers and daughters. All with tales so different, but one thing in common—we all wanted to be authors. We'd gather in folding chairs set in a democratic circle and discussed, with great seriousness, the offerings each of us sacrificed to the group. Jokes were made to break the tension. There was always tension. No aspiring author sat in that circle with any less apprehension than an accused murderer before a bench. On trial our fragile, self-inflated dream; in every chair, a wicked child with a hat pin. For years we gathered. Read numerous tales of knights, zombies, vampires, trolls, civil war romances, and space operas. Some were good. Others needed work. None were ever bad. In a place where everyone took a turn looking down the barrel, pulling the trigger was uncomfortable at best. The idea the same as the Hippocratic oath: do no harm. We were a class coming of age together, discovering how to accept criticism, build characters, and to just say no to misplaced modifiers. And we all wanted to be something. A children's novelist, a science fiction writer, the next Hemingway, King, or Tolkien. Jeff wanted to write thrillers. He liked books that drew a reader in from the first sentence and kept them reading with excitement, intrigue, and mystery. That's the wheelhouse of a thriller. I always thought the same ideal could be applied to any genre—any fiction—and kick out a good result. In many ways Riyria is a fantasy set to a thriller tempo. Not long after The Crown Conspiracy was first published, Jeff caught the golden ring landing a fantastic agent. His book was on the road to Big Six publishing. He only had to cut almost a third of the book. After he had, they asked him to put most of it back. The process was grueling, but who could argue with Glenda the Good Witch on the yellow brick road to see the wizard. Then tragedy. As his agent was on the verge of submitting to publishers…she died. As you can imagine this was devastating on multiple levels, and I could see a change in Jeff. The smile was gone. Not only had he lost his big shot, a person he worked with, who he was just getting to know, had unexpectedly died. Jeff picked himself up and went back to querying agents, back to knocking on doors and getting rejections—back to the beginning. Having read his book I was still positive he was going to make it, Jeff—not so much. You need to understand that Jeff Miller—while not a pessimist—is a highly cautious optimist. Recently married with two young children and a demanding day job, he dreamed of being an author, but it was a vision he kept up on an unreachable shelf. He could look, but never expected to touch it. Didn't matter that he'd spent years learning the craft, then applying his skill to writing and re-writing a wonderful character-based police procedural thriller; such fortunes were the rewards other people got—not him. Everyone thinks that. I tried to tell him so, to tell him his book was good. I could see it on his face, in that self-conscious smile—he didn't really believe me. I didn't believe it when people told me either. Jeff left the writer's group and moved to the Midwest a few months ago, which is disappointing as I can't see the smile on his face today. I imagine it is one of those wide, teeth-showing grins that will be with him for a long while. People will probably give him puzzled looks. It's just not normal for people to appear that happy. I'm not with him. I can't see it, but I don't have to. I've been there. I walked on that same air. 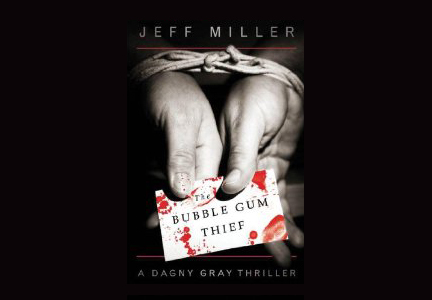 And I swear I heard a bell ring, saw a falling star, or stumbled past a four leaf clover, because you see The Bubble Gum Thief, a thriller by Jeff Miller, was published today. It all started with the theft of a pack of gum, and the ominous note he left behind: THIS IS MY FIRST CRIME. MY NEXT WILL BE BIGGER. Every two weeks, he delivers on this pledge, committing a bigger crime, and promising that the next will be even worse. When petty theft gives way to bloody murder, the stakes become clear. He may have begun with the smallest crime possible, but he’s building toward the biggest crime imaginable. There’s a method to the gum thief’s madness, and Special Agent Dagny Gray knows she can figure it out…if the Bureau will let her. But will it be in time to prevent the cataclysmic finale of his escalating spree? This holiday season help make a newborn author's dream come true. Go read the sample on Amazon. If you like it, buy it and read it. Then leave a review on Amazon. For paperback go here. To visit Jeff Blog go here. This is Jeff 's first novel, I hope it will be a huge success…I'm hoping his next ones will be bigger. Congratulations, Jeff. And just for the record…I told you so.